"Life before Canine Companions was good, but I was dependent on others," shares Amy who graduated with Service Dog Yazzen in 2005. "Before I received Yazzen, when I dropped something or needed an item out of my reach, I had to ask someone for it. At college, if I needed to use the restroom, I had to ask someone to come with me just to make sure I could get the main door open once it closed," explains Amy. "With Yazzen, suddenly I had a friend who could get items, tug open doors and help me in so many ways." In early 2014, almost nine years after first graduating, Amy knew she had to consider life after Yazzen. "I was on my own for about three to four months due to Yazzen's health. The dogs make it so much easier to be independent. But my expectations were very high. There were very big paws to fill." Amy was matched with successor Service Dog Portland II. "I am happy to report he is meeting every single one of my high expectations. Both Yazzen and Portland have been my lifelines to independence." Service dogs like Yazzen and Portland are provided free of charge thanks to donations from supporters like you. 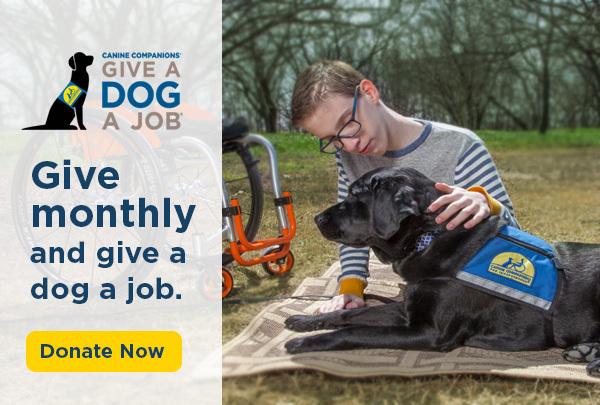 With your gift, you can make Every Day Independence Day - and Give a Dog a Job. 2016 was another record-breaking year. Placements were up 44% since 2013 and operating income increased 29.5% over 2015. But with 600 applications each year, demand is still high. See what we're doing to sustain and increase growth in the 2016 annual report. Are you a Canine Companions puppy raiser? Upload an image of your puppy to cci.org/share between now and June 19 to be considered for our 2018 Canine Companions Puppy Calendar. Please note that photos must feature your puppy in their yellow cape. Share now. Approved trading cards are now available for Canine Companions assistance dogs, puppies and breeders from our official online gift shop. Graduates and volunteer puppy raisers are used to being stopped in public, now your dog can have its own trading card to give out! Donate in honor of dad this Father's Day and change a life. We'll send a personalized card. Snoopy wants to know: What type of working dog are you? Grab your leash for DogFest. Get a free flashlight key holder with online gift shop purchase of $35 or more until June 30. Use checkout code 1122 for blue or 1121 for grey.